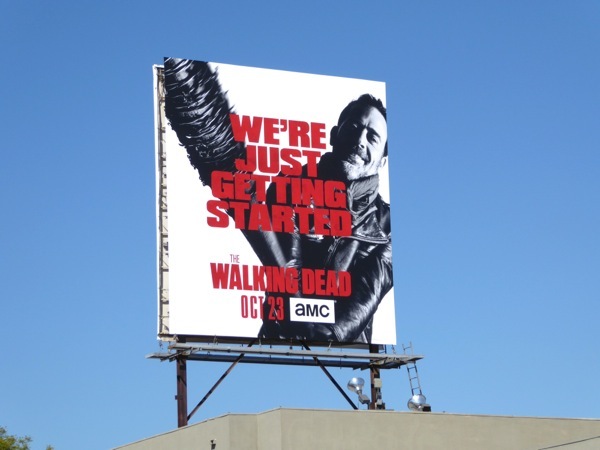 "Eeny, meeny, miny, moe…", the question on everyone's mind as The Walking Dead enters its seventh sensational season, is who died at the hands of 'Negan's' barbed wire bat 'Lucille' at the end of last season? 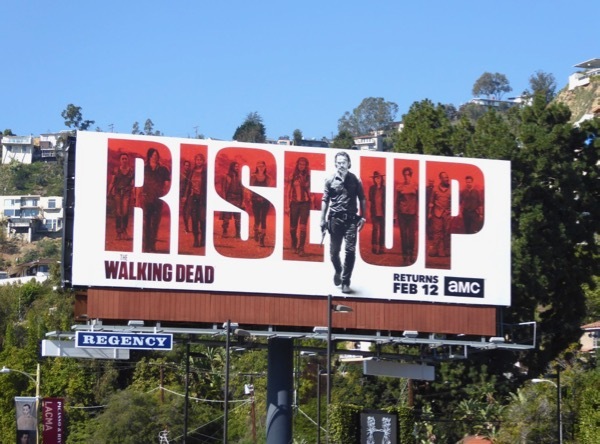 These days on the post-apocalyptic zombie drama it's not just the undead you have to worry about, but all the other humans vying for survival in a drastically different world. 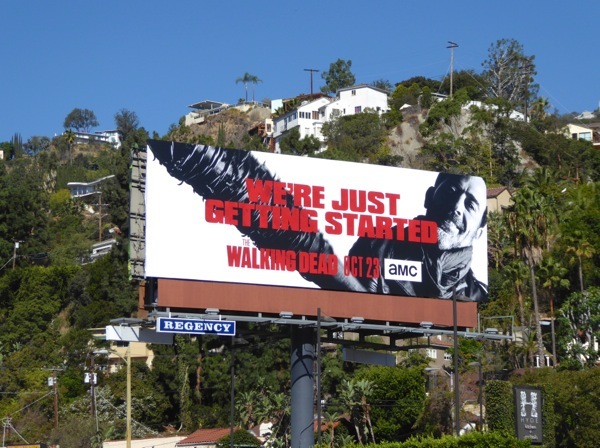 When we last left 'Rick Grimes' and his band of plucky survivors from the walled-off community of Alexandria things didn't look that good for someone. 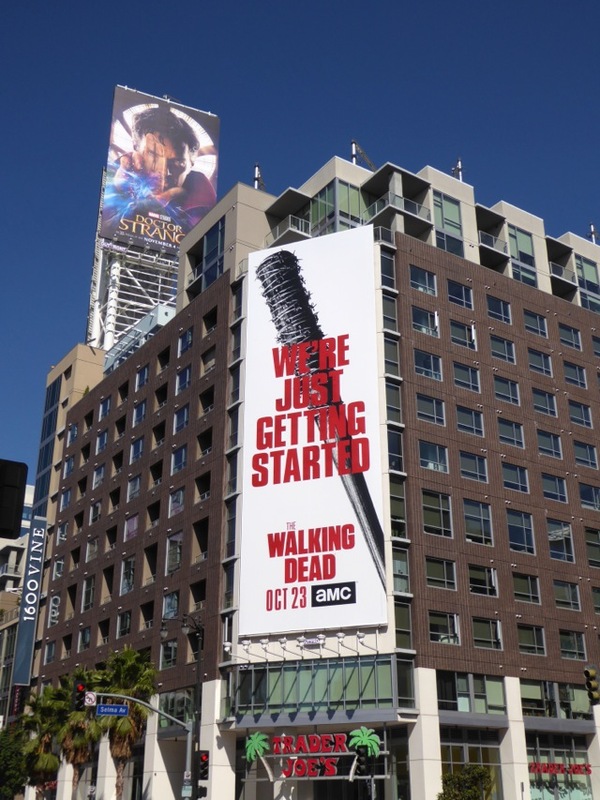 If the series follows the comic books then 'Glenn' may be a goner after already faking us out with his death last season, but then maybe his pregnant wife 'Maggie' who was in need of medical attention will be bludgeoned to death instead (it's not the first time the show has killed off a pregnant woman). 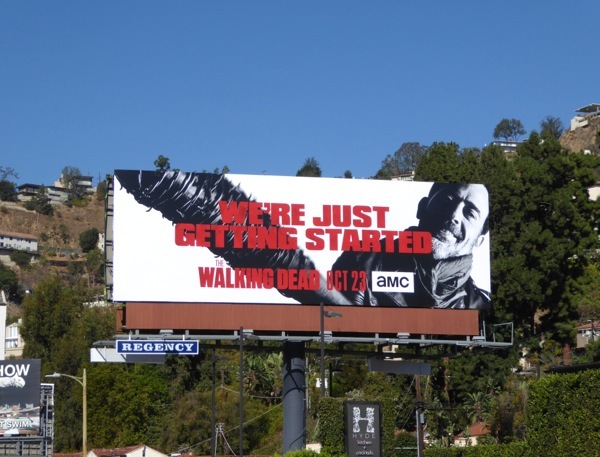 There are so many fan-favourite characters like 'Daryl', 'Michonne', 'Carl' and more that it's almost impossible to think who it could be without some kind of huge implications for the other survivors now under the thumb of a new tyrant. 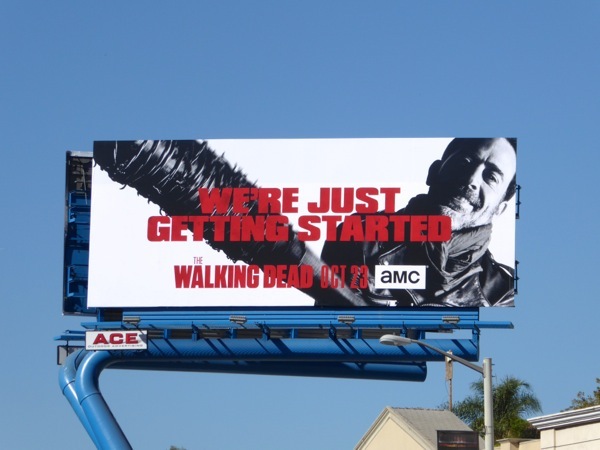 And also what about 'Carol' and 'Morgan', what new community, or Kingdom, and its people have they discovered? 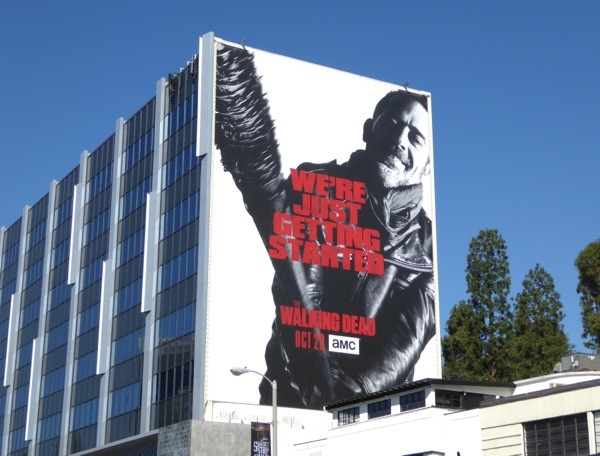 These wicked 'We're just getting started' billboards will get any TWD fan excited, especially as Jeffrey Dean Morgan seems to be perfectly cast as the villainous Negan. It's strange when you think the actor's played such lovable characters in the past, like the 'Winchester Boys' father in Supernatural, heart patient 'Denny Duquette' and love interest of intern 'Izzie Stevens' in Grey's Anatomy and recently 'Alicia Florrick's' mysterious investigator lover in The Good Wife. However he's no stranger to playing nasty characters ripped from the pages of iconic comic books either, as he played 'The Comedian' in the big screen adaptation of Watchmen back in 2009. 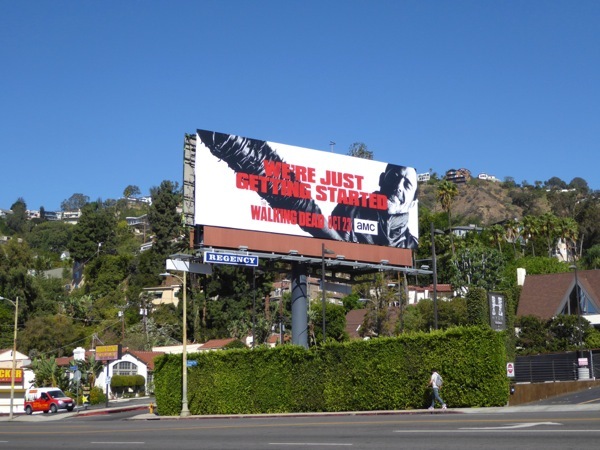 These striking season seven billboards were spied along the Sunset Strip and Beverly Bouylevard on September 26, 2016. 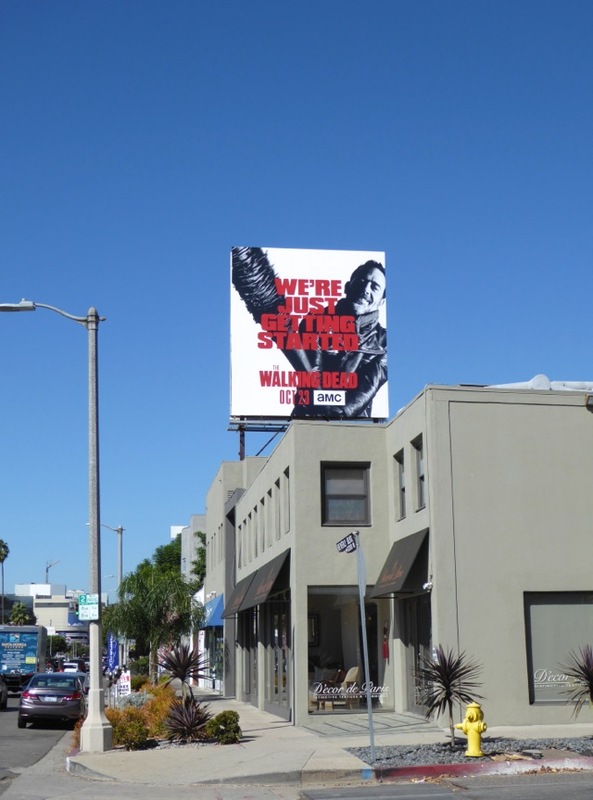 If you're a fan of the show, be sure to also check out all these previous season promo billboards for The Walking Dead, plus this Daryl Dixon and Walker costumes on display recently at the FIDM Museum in Downtown L.A.
We may just be getting started with Negan's reign of terror, but it looks like it's going to be one hell of a ride that'll continue to make The Walking Dead one of the most compelling on-going television dramas to watch. 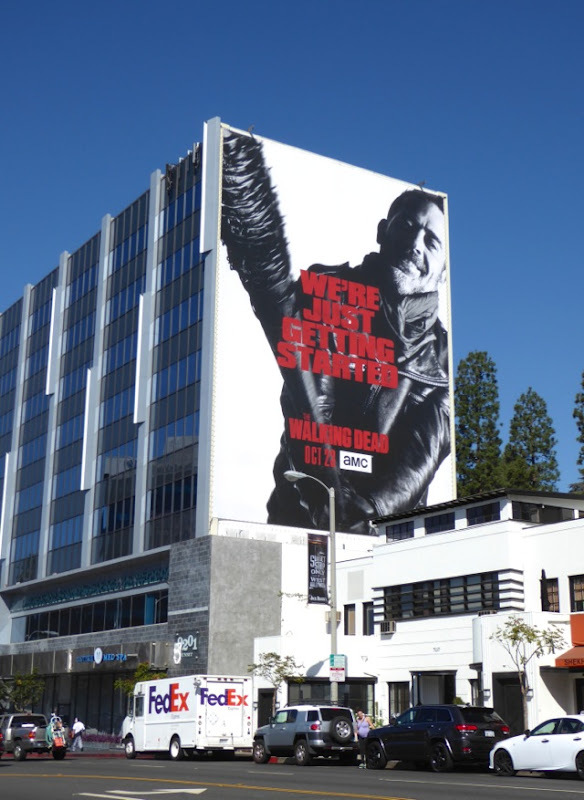 UPDATED: This seasons seven ad creative looks even more impressive when it's been super-sized. 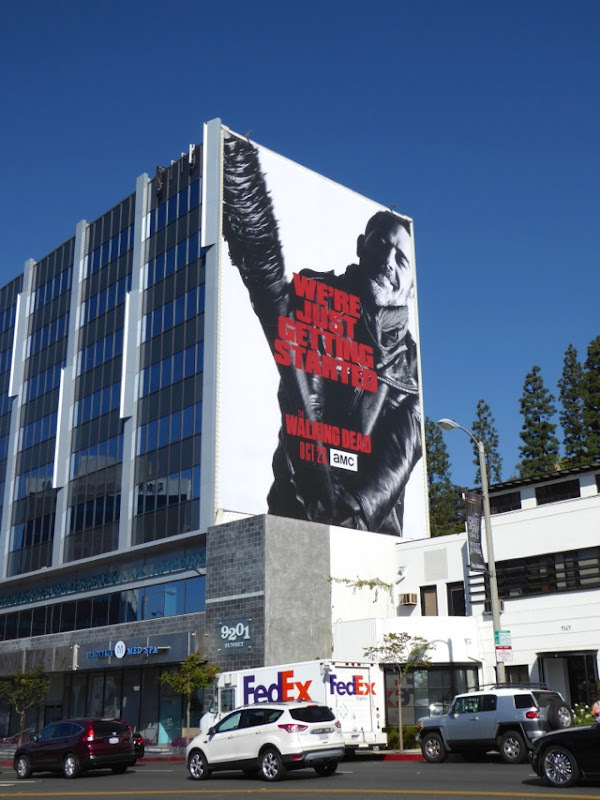 This giant billboard for The Walking Dead was snapped along the Sunset Strip on September 29, 2016. 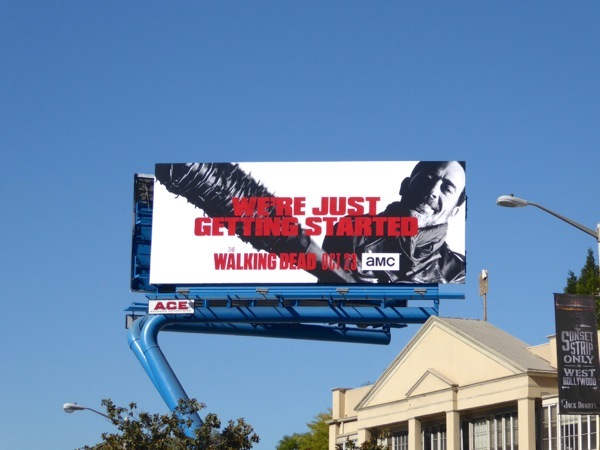 Daily Billboard also thinks there'll be a lot of Negan impersonators walking the streets this Halloween. 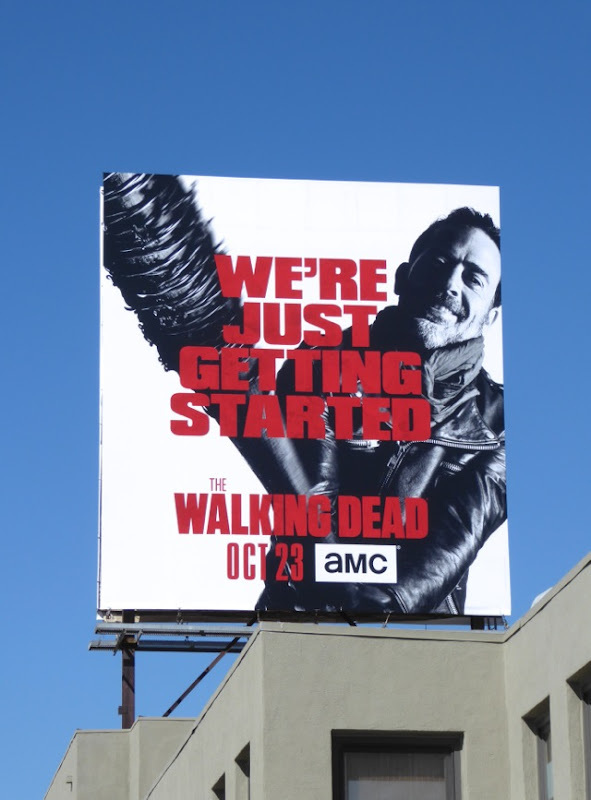 Now batter up, this season looks like it's going to be most brutal yet (and that's saying something for a show about zombies). 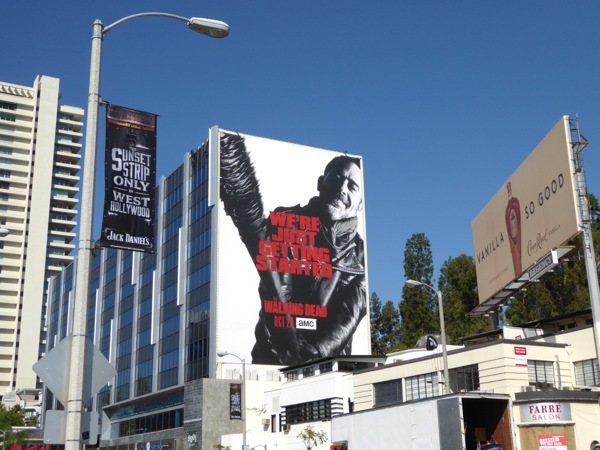 UPDATED: Negan's bat 'Lucille' even gets its own billboard this season and this vertical ad creative was snapped at Hollywood's Sunset & Vine on October 11, 2016. 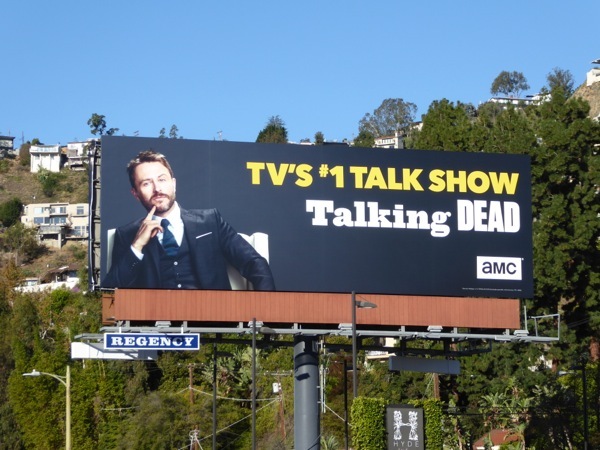 UPDATED: Daily Billboard also couldn't help but share these billboards for The Walking Dead's companion talk show hosted by Chris Hardwick. 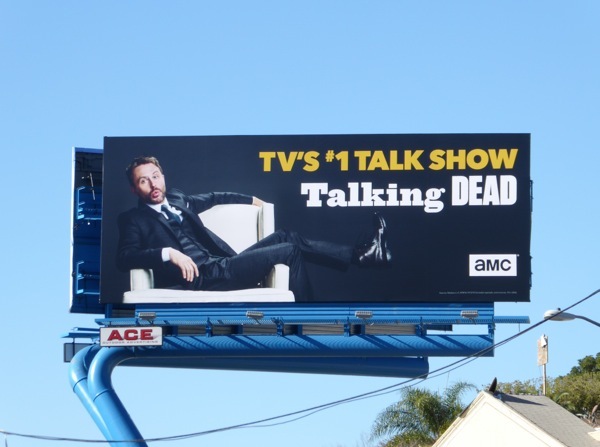 These ad creatives for TWD's after show, where celebrity fans, stars and creators are guests, were snapped along West Hollywood's Sunset Strip on December 17, 2016. 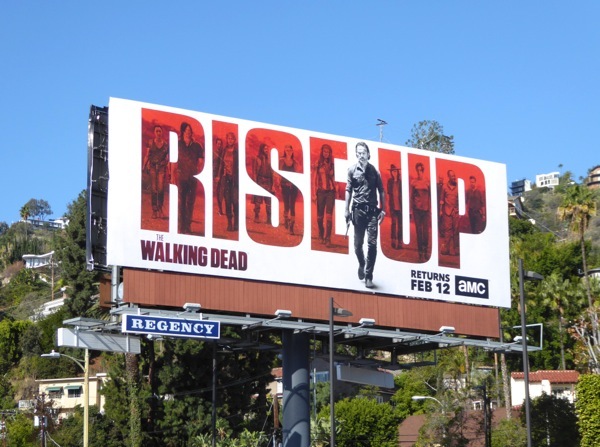 UPDATED: Meanwhile this 'Rise Up' billboard for the show's midseason return, featuring Rick and his reunited fellow survivors, seems to be the perfect anthem for these dark times. 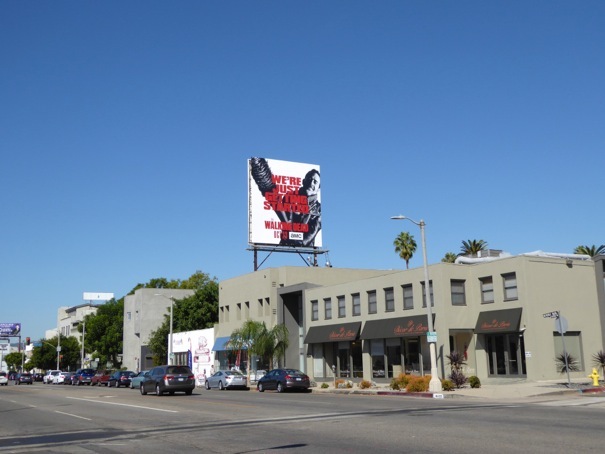 This season seven part two billboard was snapped along the Sunset Strip on January 6, 2017. 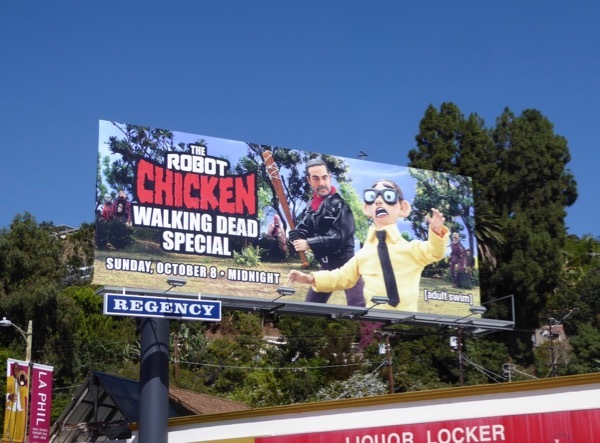 UPDATED: Here's also a fun billboard spoof of Negan and Lucille for The Robot Chicken Walking Dead Special photographed along the Sunset Strip on September 25, 2017.